Photo by Rees Hughes Clam hunters seek their prey at Clam Beach. Photo by Rees Hughes Some — like this long time expert — do better than others. On a recent late April morning, in the hazy half light of dawn, I found myself wearing rubber boots, burdened by several layers of clothing and a shovel, and marching awkwardly through soft sand of the fore dunes to the ocean. There were hundreds of us, bulky and burdened, in a surreal trudge toward the waterline. As we dispersed along the beach, tapping repetitively with shovel handles, it could have been a scene from any zombie movie. I imagined Rod Serling's voice-over, "There is a fifth dimension, beyond that which is known to man. It is the middle ground between light and shadow, between science and superstition." I have joined the throngs of Humboldt county clam diggers. This area is filled with clam-digging devotees, human predators who religiously study tide charts, circle the dates of minus tides on their calendars, and make the pilgrimage to our flat, sandy beaches. My venture into their world had begun when it was still pitch black, and Tom pulled into our driveway, the knock of his diesel breaking the pre-dawn quiet. For several days I'd been building a small pile of clam digging gear on the side of our front porch, preparing for my first clamming trip ever. I had erred on the side of overkill. I tossed most of it in the cab; shovel in the back. By the time we crested the hill south of Clam Beach, we could see the eastern sky lightening faintly and a stream of headlights exiting 101 and turning west. The numbers would soon swell and people would spread along the length of Clam Beach north of the mouth of Strawberry Creek. And this was a Friday, at an hour when most sane people were still in bed. This was my twilight zone. Tom pulled on his waders. I just had shorter rubber boots. We donned net bags to store our bounty and garden gloves with rubberized grips. We carried shovels, and Jeff, who joined us here, opted for a clam gun. The gun is basically a section of plastic or metal pipe closed at one end except for a small air hole, which can be covered to create the suction needed to extract a reluctant clam from its sandy bed. The tapping, or "bonking," as Jeff called it, causes the clam to withdraw its siphon, leaving the slightest of indentations or dimples on the surface of the beach. That "tell," to the practiced eye, is enough to trigger a quick series of actions designed to get the clam before it can escape. If you are using a shovel, you quickly dig straight down on the ocean side of the dimple, then reach your hand into the sandy/watery mixture to grasp the razor clam. This is the theory, anyway. Jeff, who has been clamming for two years, noted, "It is not so easy as it looks." I soon agreed. There seemed to be two kinds of clam hunters. Those who preferred the shallow water periodically washed with waves and those who focused on the damp but drier beach. During minus tides, both options are viable. I focused my tapping on the drier areas just above the reach of the waves. "Fewer moving parts," I rationalized. However, Tom, in the water, was the one getting the clams. I declared the sand bar I had been working devoid of clams. "Maybe that is why the bulk of the diggers were cheek by jowl farther north," I thought, visualizing the clams jumping into their hands. Others soon drifted into my hopeless claim. "Not much here," I warned them as they tapped and stomped an area Jeff and I had just finished tapping and stomping. Almost immediately, several of these veterans were on their knees within mere yards of me, groping for clams in a small pit they had revealed with a quick thrust of the shovel. Out came a hand grasping a razor clam. This process was repeated several more times before I edged over, hoping to learn their secrets. Most of these fellows had been clamming since their youth and generously pointed out the clues they were seeing. For the life of me, I couldn't see them. Jeff spotted a minuscule hole in the wet sand and ordered me to dig. I heard the sound of shovel hitting shell, submerging my hand to grab the wounded clam. I held my prize aloft accompanied by a triumphant "whoop." Unfortunately, that moment was the high point of my outing. As we returned to the parking lot some time later, we encountered two biologists surveying the exiting clam-anistas and recording the number of clams each had bagged. I was clearly an outlier, although by no means the only one leaving with such a light bag. As the tide finally cleared the beaches, though, most of the clam diggers had been much more successful. These robust harvests represent a resurgence of the Siliqua patula or Pacific razor clam on Clam Beach. I spoke with one woman who remembered, as a little girl, following along after a tractor pulling a harrow down the beach during minus tides and picking up the exposed clams. 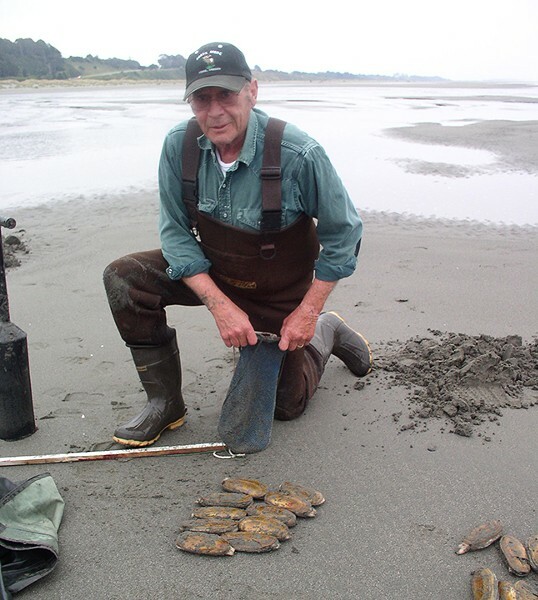 Since 1953 there have been restrictions on clamming along the beaches of Del Norte and Humboldt counties. For example, during odd-numbered years, Clam Beach south of Strawberry Creek is closed and during even-numbered years, the beach between Strawberry Creek and Little River is closed. A daily limit of 20 (regardless of size or if broken) was imposed in 1963. However, in the early 1980s the population of clams on Clam Beach seriously declined, and it is only over the past few years that the numbers have recovered. These clam beds will be exposed again by a week of minus tides between May 23 and 30. For the first couple of days, the low tides will occur before daylight, but by May 25 the conditions should be excellent. Do not forget that you will need to have a fishing license. Tom was kind enough to share his success with me once we got home, and patient enough to extend his instruction to cleaning and gutting. Adult razor clams are about 4 inches long (the largest on record in California was a 7-inch specimen) and relatively meaty. Most of my exposure to clams has involved the use of a can opener. Fresh clam meat is a very different culinary experience. Breaded and lightly pan fried with a little lemon, it is delicious. Some of the remainder has been converted into chowder. And, once cleaned, clam meat freezes well too. When you catch a living clam with your own hands, you realize the importance of honoring the sacrifice that clam has made by taking real care in food preparation. Initially, I wasn't sure whether to try again. Given the cost of just the fishing license for my recent adventure, that was a lot of clams to pay for one measly bivalve. But a couple of days later, I was back walking the beach and encountered another wave of successful clamsters. When I got home, I checked the tide tables and circled the dates in my calendar for the next minus tides. I knew I would return.